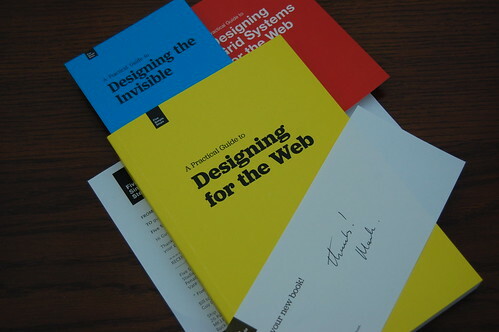 Mark Boulton’s Five Simple Steps: A practical guide to designing for the web has to be my favourite web design book of the year. One of the many things I really love about it is the personalised anecdotal style applied throughout. 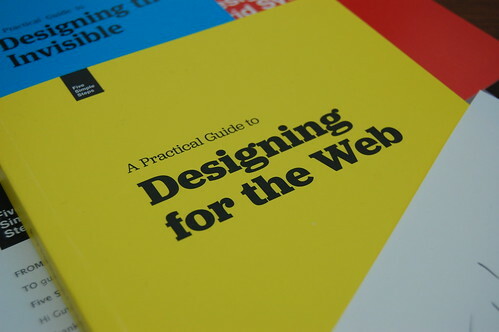 It’s the kind of book that will age gracefully as it doesn’t dwell too much on current trends or techniques, supplementing them with solid age-old design theory from someone who has had formal training in typography, layout and colour theory. Mark illustrates each of his points with a case study from his own vast portfolio and other examples from the web and print. Be it the enormous task of redesigning the Drupal community or the De Standard newspaper websites to the time he spent designing endless tables of printed data in his early career. The book has bags of personality and really does fill a void in my bookcase that has been begging to be filled for some years. Mark self-published his book and the attention to detail cross the entire process shines through. The enclosed postcards show us that this is the first in a series of five simple steps books and the handwritten compliment slip really added to the whole experience. Even the box it was delivered in showed that ever ounce of the design had been poured over for unending hours. I can wholeheartedly recommend it. Buy Five Simple Steps, A practical guide to designing for the web direct from Mark Boulton Design LTD for £29 or get the PDF for £12.